Do you believe in magic? Some say that it doesn’t exist but winning huge cash prizes with pure luck at online slot machines is nothing else but magic. 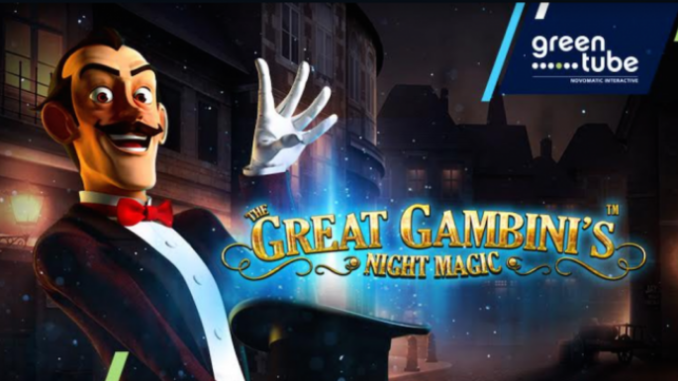 Inspired by the greatest magicians of our time, Greentube released a slot called The Great Gambini’s Night Magic which revolves around The Great Gambini’s show where he has an opportunity to perform his tricks and show us some magic. Real or not? It’s up to you to decide once you start spinning the reels of this extraordinary online video slot. The game is live and can be played at all Greentube’s B2B partners. The first thing that captures players’ attention is the amount of effort that the team of developers and designers had put in to create outstanding animations in this online video slot. The animations, along will high-quality graphics, will take your breath away as you watch the Great Gambini perform his magic tricks in front of you. The slot features a total of five reels and 20 paylines and includes popular special symbols. The first special symbol you will come upon is the Wild Hat, which will substitute all other symbols on the reels in order to help you create big wins. The only symbol that cannot be substituted by the Wild is the Scatter, which is also called the Free Spins Cube. If you manage to land three, four, or five scatter symbols on the reels, you will trigger the Free Spins feature and receive 5, 10 or 15 free spins. Once you trigger this feature, you will be granted a special symbol for every spin. If you are lucky enough to land the special symbol on the middle reels (which is also called the Magic Reel), you will convert it into a stacked symbol and copy it to all reels to the left in order to create winning combos. Furthermore, the Magic Reel can also expand to reels four and five, and if you are lucky enough to trigger this event during the free spins feature, it will stay as such until the end of the bonus game. The Great Gambini has influence over your luck with his magic tricks, and he can choose to extend your free spins features if he wants to by using his magic. Therefore, pay close attention to the magician during the bonus game. Finally, the game has four game modifiers that all impact your game positively and increase your chances to win lucrative prizes as you spin the reels. These four modifiers are called Symbol Levitation Reel Modifier, Reel Magic Reel Modifier, Quick Change Reel Modifier, and Guillotine Win Reel Modifier. Greentube has done an outstanding job once again, and they already have a huge portfolio of extraordinary online video slots. Make sure to check them out and enjoy some very interesting topics.